This addon was designed to compliment the enhanced colourblind mode features that were added into the game with the release of Patch 4.3, "Hour of Twilight". Adds a dropdown menu to the game which will allow you to choose a colour shade that will best suit your colourblindness easily. Saves your option and automatically re-applies between sessions. To use this addon, simply open the Main Menu, click on Interface and then click on Help. 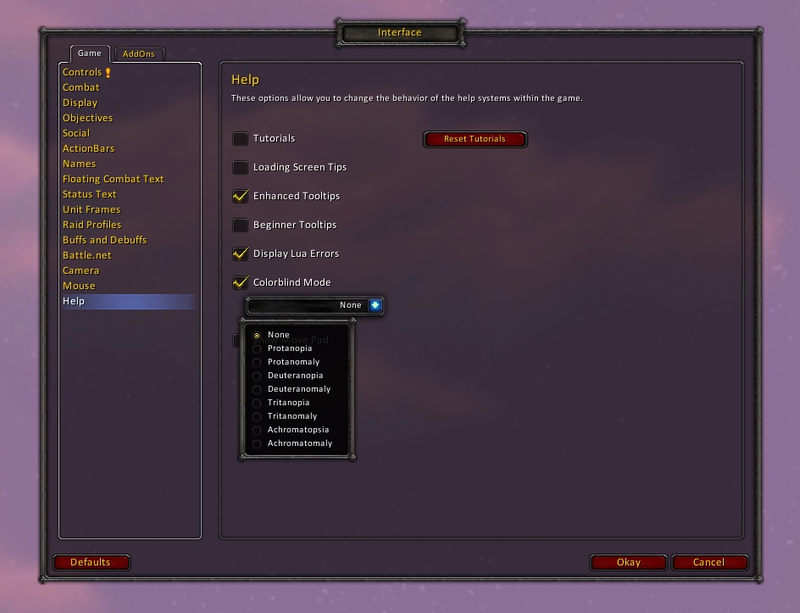 A new selection menu will appear beneath the checkbox labelled "Colourblind Mode" (see screenshot). Click on this menu and you will be able to choose a colour shader which best suits your type of colourblindness. If you've found an error or would like to suggest a feature, please make a new ticket in the issues hub or leave a comment here. - Removed SavedVariables as Blizzard have fixed a bug that prevented the shader setting from being saved between sessions. - Some small code tidy up. Any chance of an update for 6.0.2? Please and thank you. Simply awesome. Because of this addon I'm seeing this game in a whole new light. I can actually see the difference between rare items and epic items that are linked in chat without having to click on them to tell the difference. I remember using the original colorblind addon for ages, possibly all the way back in vanilla before Blizzard finally implemented it into the game. Thank you.